One team at Le Mans has a huge bone to pick with last year’s results. Toyota’s car broke down from the lead last year right before its final lap, causing it to not even get classified as a finisher. This year Toyota brought three cars, one of which set a new lap record in qualifying. That new record gave their No. 7 pole position for this year’s running of the 24 Hours of Le Mans. The top LMP1-class No. 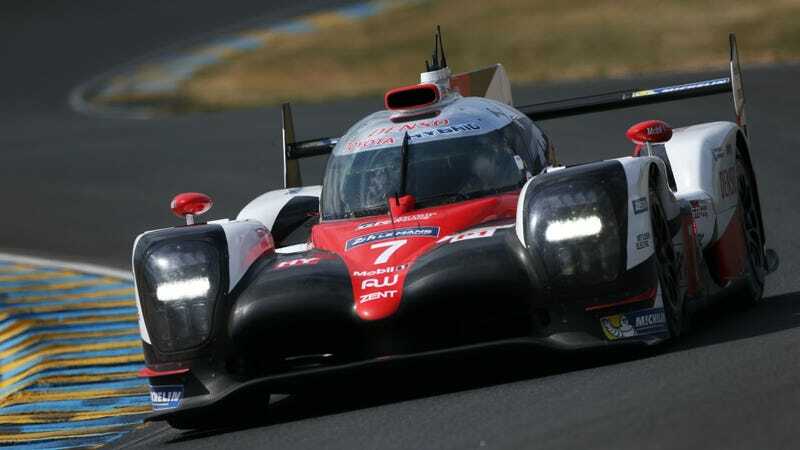 7 Toyota TS050 starts in the front after setting a lap time of 3:14.791 under what former Toyota driver Alex Wurz described as the absolute perfect conditions to do so during this year’s second qualifying session. It bested the previous fastest lap around Le Mans’ Circuit de la Sarthe by a full two seconds, and no one else in qualifying could even come close to that lap time. Behind it starts the No. 8 Toyota TS050, which set a 3:17.128 despite experiencing an oil supply problem that forced them to swap engines in the second qualifying session. The fastest top-class Porsche—the No. 1 Porsche 919—ran a 3:17.259, right on the tails of the No. 8. The No. 2 919 qualified fourth was also pretty fast but experienced a mechanical failure in the final qualifying session that forced Brendon Hartley to pull off and abandon the session. Finally, the No. 9 Toyota TS050 came in fifth and the lone non-manufacturer LMP1 of ByKolles qualified sixth overall. We’re going to need to hold on to our butts for some close racing. The top three qualifiers in LMP2 all qualified just barely over half a minute from each other—and mind you, that’s on an 8.469-mile track! The No. 26 G-Drive Racing (TDS) Car starts from pole in LMP2 after setting a fastest lap of 3:25.352. It is the year of the Oreca chassis in this class, though—the top nine qualifiers in LMP2 were all Orecas. The top six in the hotly contested GTE Pro class all threw down lap times within a minute of each other. The No. 97 of Aston Martin Racing starts from pole with a fastest lap of 3:50.837, followed by the No. 51 AF Corse Ferrari behind it. The fastest car from last year’s winning Ford Chip Ganassi Racing über-effort of four cars was the No. 69, which starts fifth. The fastest brand-new mid-engine Porsche 911 RSR, the No. 92 qualified seventh. Fortunately, for fans of Glorious ‘Murica Noises (read: big V8s), our French Corvette-racing brothers-from-another-mother at Larbre Competition took pole position in GTE Am with their delightfully wacky glow-in-the-dark art car. Their No. 50 Corvette C7.R set a fastest lap of 3:52.843, but this is another class where the competition is going to be touch. The next four cars all qualified within a minute of the No. 50 Corvette. Here it is: the start of Toyota’s Great Redemption Run of 2017. Will they be able to pull it off this year and become only the second Japanese manufacturer ever to win Le Mans, or will Porsche win yet again? You can view the full qualifying results here.